It's been a pretty quiet Thanksgiving weekend so far in the geo community but I ran across a reference to a New York Times editorial from a week or so ago, talking about recent photos taken by ASU's Lunar Reconnaissance Orbiter Camera circling the moon. 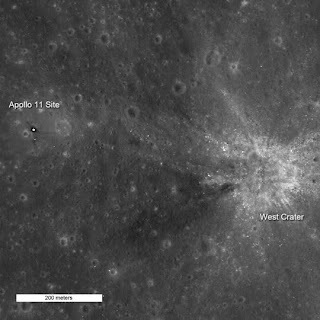 The camera has been capturing images of the Apollo landing sites, and added one of the original Apollo 11 site. Yet there’s something terribly wistful about these photographs of the Apollo landing sites. The detail is such that if Neil Armstrong were walking there now, we could make him out, make out his footsteps even, like the astronaut footpath clearly visible in the photos of the Apollo 14 site. Perhaps the wistfulness is caused by the sense of simple grandeur in those Apollo missions. Perhaps, too, it’s a reminder of the risk we all felt after the Eagle had landed — the possibility that it might be unable to lift off again and the astronauts would be stranded on the Moon. But it may also be that a photograph like this one is as close as we’re able to come to looking directly back into the human past. There the lunar module sits, parked just where it landed 40 years ago, as if it still really were 40 years ago and all the time since merely imaginary. The Arizona Geological Society's J. Harold Courtright Scholarship is being awarded this year to Jeff J. Geier, a student in ASU's School of Earth and Space Exploration (SESE) working on an M.S. in geological sciences. The title of Geier’s research is: Timing and Structural Control of Gold Mineralization, Santa Gertrudis Mining District, Sonora, Mexico. Professor Steve Reynolds is Geier’s thesis advisor. The award, in the amount of $2,000, is intended to help defray thesis-related expenses. The award will be presented at the AGS December dinner meeting. In evaluating proposals, the AG S Scholarship Committee considers the scientific significance of the proposed research, the applicability of the research methodology to the problem at hand, and the likelihood that research goals can be achieved. 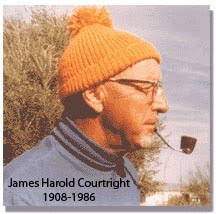 Harold Courtright had a life-long interest and career in mining and geology. He honed his field mapping skills and porphyry copper exploration techniques in the Northern and Southern Cordillera and was instrumental in discovering some of the better-known porphyry copper deposits in Arizona and Peru, including Silver Bell and Toquepala. The scholarship fund, set up by the Arizona Geological Society after the death of J. Harold Courtright in 1986 and largely funded by AGS member contributions, is designed to promote graduate research in all geology fields with special emphasis on field geology, economic geology, and the study of ore deposits. Graduate students working towards a degree in the geological sciences at Arizona State University, Northern Arizona University, and the University of Arizona are eligible to apply. Bob presented his model at an informal workshop at the caverns Discovery Center this morning to a group of hydrologists, geologists, and others who are engaged in the EIS process for the Rosemont copper mine. The idea was to look at some of the complexities of mountain fronts, carbonate reservoirs, and groundwater flow. Also presenting was Geary Schindel, Chief Tech Officer for the Edwards Aquifer Authority in San Antonio, Texas, who described karst aquifer behavior and management. 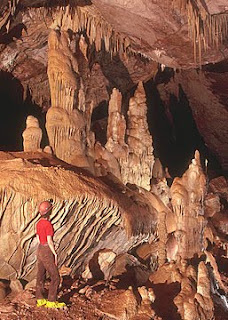 Part of the discussion centered on the potential for encountering karst terrain in the Rosemont mine excavations. Mine geologist Jeff Cornoyer reported that they had not encountered any caves in the more than 320,000 feet of holes drilled in the mine area. One of the more surprising slides Bob Casavant showed was of an EM survey by hydroGEOPHYSICS, across the Kartchner Caverns fault block. The known cavern rooms stood out clearly. 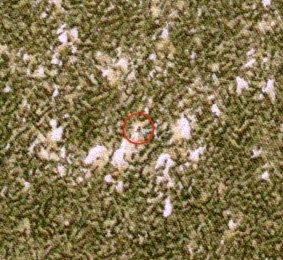 But there were also other, similar anomalies that may show undiscovered rooms to the west of the current cave complex, deeper under the mountains. Bob nicknamed the largest anomaly, the "West Wing." 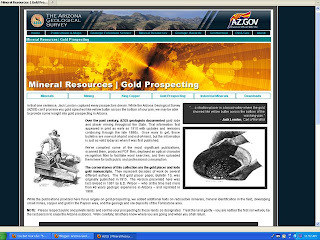 The amount of materials downloaded from the AZGS Website set a record in October 2009, with 49.8 Gb transferred. This is the first time it topped the amount from June 2007 when the first set of Earth Fissure maps were released. Geologic Extension Service chief, Mike Conway reports that last month there were 12,584 separate downloads. The gold bulletins led the way. The recently released report on Holocene mapping of the San Pedro River was downloaded over 1100 times. The Arizona Geological Society is looking at setting up a program to capture images, videos, and oral histories of Arizona geologists and other geologists who have worked in Arizona. In-coming AGS President Mark Cocker proposed the idea at the AGS Executive Committee on Thursday night and it was enthusiastically received. An ad hoc committee is going to pursue the proposal. Mark noted that AGS members have been involved in remarkable events and discoveries in Arizona and around the world but also have wonderful anecdotes and personal stories about the day to day ups and downs of doing geology. The idea is to record remembrances, along with photos, slides, letters etc, and distribute them on CDs and online. Along these lines, the AZGS recently received a collection of short movies of Troy Pewe, the legendary ASU geology professor, from his family. They show Troy, along with students and colleagues, doing field work and exploring the Grand Canyon and adjacent regions. 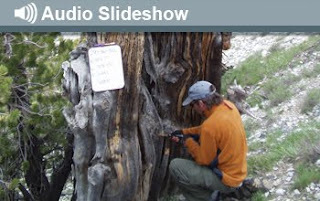 We've posted them on our Visualizing Geology web page, something that is still being built. We have a rich history that needs to be preserved, in conjunction with similar projects such as the Miners Story Project, Arizona Memory Project, or at the national level, This American Life. 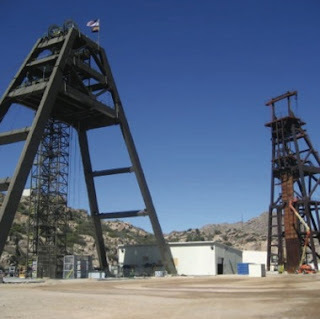 A bill intended to stop the Rosemont copper mine south of Tucson, could effectively ban access by anyone to US Forest Service lands in Pima and Santa Cruz counties [right], including places such as Sabino Canyon and the rest of Coronado National Forest in the two counties. My sources say that US Forest Service attorneys are advising department officials that a section of HR2944, "Southern Arizona Public Lands Protection Act of 2009," that would prevent "all forms of entry, appropriation, and disposal under the public land laws," would mean not only no mining, but no grazing, logging, hunting, fishing, hiking or any other use of forest lands. The bill, introduced by Rep. Raul Grijalva and Rep. Gabrielle Giffords, also would prevent entry to BLM lands under the general mining laws. The bill targets mining and geothermal energy, a renewable energy resource that BLM has been promoting by direction of the President, on federal lands in Pima and Santa Cruz counties. National Parks, Forest, and Public Lands Subcommittee in Washington DC. 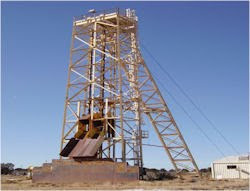 To withdraw certain Federal lands and interests located in Pima and Santa Cruz counties, Arizona, from the mining and mineral leasing laws of the United States, and for other purposes. 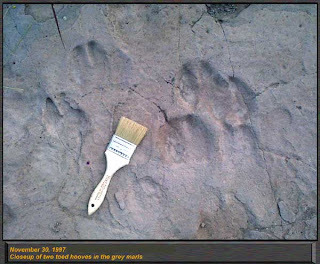 This Act may be cited as the `Southern Arizona Public Lands Protection Act of 2009'. SEC. 2. 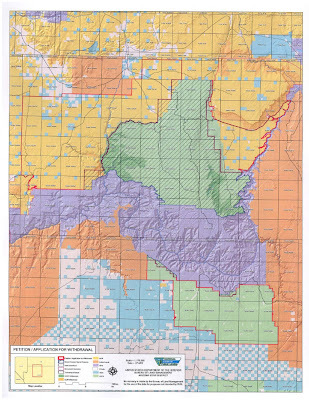 WITHDRAWAL OF FEDERAL LANDS AND INTERESTS LOCATED IN PIMA AND SANTA CRUZ COUNTIES, ARIZONA. (3) all federally owned interests in Bureau of Land Management lands in Pima County, Arizona, are withdrawn from entry, location, or patent under the general mining laws. The meeting of the Arizona Legislature's Ad Hoc Committee on Mining Regulations on Monday was webcast live and they have now posted the video online along with video from the first meeting of the committee on Nov. 2. My presentation on the AZGS's role in mineral resources and a live fly-over demo of some of our projects is the first one in the session. It's about 15 minutes with another 15 minutes of questions. Monday's session in total is about 2 hours; the prior one is 3 hours. We got some nice feedback and comments from Bernie at the ArcGIS Explorer Blog, who described it as "just perfect" to share on GIS Day. Thanks Bernie! We like your software. At last night's dinner honoring UA geology professor Spencer Titley, the AZGS presented him with a mounted copy of the reissued geologic map of the Twin Buttes quadrangle, now dedicated as the "Spencer R. Titley Honorary Map." This is the first time in the history of the Survey that a map has been named in honor of someone. 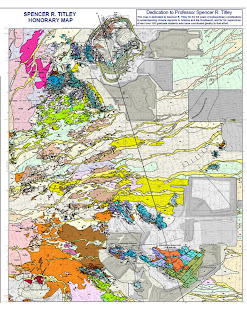 We chose the Twin Buttes map because of Spencer's pioneering work on the origin and nature of copper porphyry deposits, using the Twin Buttes and Mission-Pima mines shown on this map. NSF put out an striking audio slide show on the research as well as featuring the story in the science news email they distribute. The story is getting lots of national as well as local attention. He warned that the federal segregation of nearly 1 million acres of lands from mining claims has the potential to be a "100% deal killer for uranium mining in Arizona." Roberts said the U.S. imports 90% of our uranium for use in nuclear power plants. He said that the Arizona Strip region contains "carbon-free energy equal to 13 billion barrels of oil" and the uranium deposits are among the richest in the U.S. He argued that modern mining techniques and the nature of the uranium-bearing breccia pipes means that the size of mining operations is a small fraction of previous mining operations and post mining reclamation will leave little or no trace. The mines are expected to be operational for only a few years each. On my drive home from the hearing in Phoenix, I heard a radio news report that the Center for Biological Diversity, Sierra Club, and Grand Canyon Trust, had filed a lawsuit against the BLM for permitting the Arizona #1 mine. But in the presentations by industry representatives earlier in the afternoon were proposing much more modest changes. Rusty Bowers from the Arizona Rock Products Association (sand and gravel, aggregates, limestone, etc) said their industry can meet environmental standards but asked for flexibility in how to get there. He said some regulations micromanage how the companies have to meet certain standards which raises costs and prevents them from approaches that could be more effective. Marcus Middleton, from Freeport McMoRan, was there as chair of the Arizona Mining Association's environmental committee. He urged the Legislature to ensure that state regulatory agencies have enough resources to carry out their duties in a timely manner, so that economic development projects are not delayed. He said this doesn't mean just providing direct state appropriations but allowing for alternative resources. He urged state regulatory agencies resolve conflicting and overlapping rules and as an example mentioned well spacing requirements from ADEQ that needed to be resolved in an iterative process with ADWR. ADWR Director Herb Guenther promised to work with ADEQ to address this. Middleton also proposed a limiting state agencies imposing any rules more stringent than federal requirements unless they have specific legislature authority to do so. I gave a short presentation on the mission of the AZGS, especially related to mineral resources. One of the committee's tasks is to look into a central database for land management and resource information. So, we did our first live demo of the emerging capabilities of the Geoscience Information Network (GIN) which integrates data from a variety of data providers. The committee hearing was webcast live and the video is supposed to be archived. When it's posted, I'll share the url. On Thursday, a federal judge ordered Grupo to prepare a new contract to the United Steelworkers union that represents 2,500 Asarco workers. The world premiere of "Mud Max," an hour-long documentary on the mud volcano 'Lusi' near the East Java town of Sidoarjoin in Indonesia, was held in Scottsdale on Friday night, hosted by ASU's School of Earth and Space Exploration (SESE). 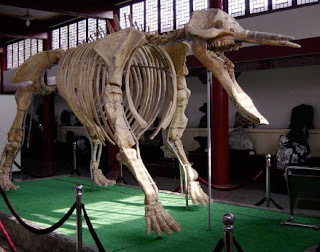 Indonesian officials and scientists were joined by a dozen journalists at the invitation-only crowd of about 150. As nice as the evening was, the movie did not measure up. It tries to tell the story of what's become known as the Lusi mud volcano, the controversy over its origin, and the impact it's had on tens of thousands of residents displaced by the eruption that began in 2006. An oil company drilling in the area is blamed by some for triggering the event, although there are court rulings that they are not responsible. The competing cause is a series of earthquakes just preceding the initial eruption. Unfortunately, the movie doesn't tell the story. It jumps around so much that it becomes a giant puzzle trying to figure out what's going on. Maps are shown all too briefly, with distracting flashing dots, so that before you can figure out what you're supposed to be looking at, the film's moved on to another scene. There are descriptions by drilling experts that are hard to follow and out of context. The film struck us as a rough first draft. They should take this back to the editing room and re-cut it. Perhaps if you followed all the legal and technical issues very closely, the significance of many parts would fall into place. Some more illustrations to explain technical descriptions would help. It was never clear where the oil well was located relative to the eruption. The presence or lack of steel casing to some depth in the well apparently was a key issue in the legal proceedings. Late in the film, the narrator dismisses the claims of environmentalists and praises the generosity of the oil company owners so lavishly, that I started to wonder if this was a company sponsored film. This might have been a wonderful film - there are all the elements for a fascinating and compelling story - but the producers missed their opportunities. Instead of "Mud Max", a better title might be "Muddled to the Max." Congress renamed the Morris K. Udall Foundation, adding brother Stewart's name to the federally-chartered organization. Stewart's son U.S. Senator Tom Udall was one of the speakers along with his cousin and Mo's son and fellow U.S. Senator Mark Udall from Colorado. Stewart, who is nearly 90, spoke a little faltingly, but with passion and humor. There are more details about Stewart's legacy in the Arizona Daily Star article. 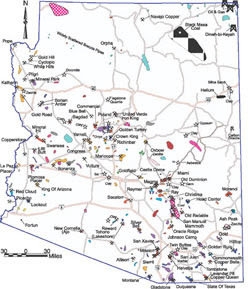 More than 50 AZGS publications and maps on geothermal energy in Arizona are now online and can be read or freely downloaded. The publications represent more than 30 years of studies and investigation by AZGS geologists and other contributors and collaborators. There is growing interest in geothermal energy across the country and in Arizona, and by making these reports more easily accessible, we hope to encourage more exploration and development of this renewable energy resource. 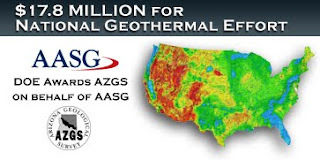 AZGS is a partner in developing the new National Geothermal Data System (NGDS) and is the lead agency for the State Geological Surveys in a US Dept. of Energy project to deploy the NGDS in each state and populating it with state-specific data. 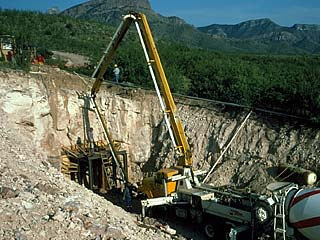 The mine will be an underground operation of a breccia pipe, using an existing 1252 foot deep 2-compartment shaft. Mining will be done 4 days per week, at a rate of 335 tons per day. 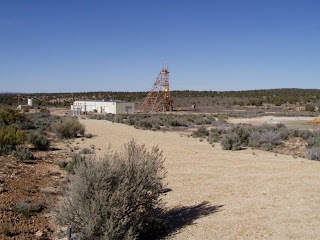 The ore will be hauled by truck to the companies White Mesa mill near Blanding, Utah. The mine will employ 32 people. 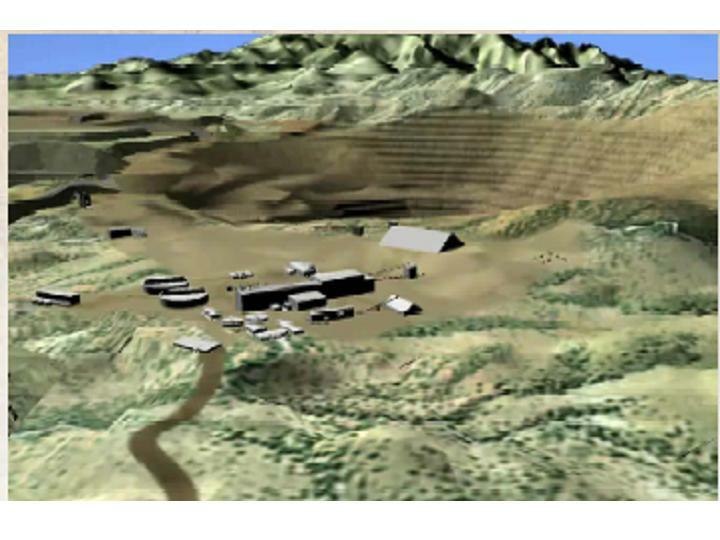 The highly anticipated groundwater flow model for the simulation of the Rosemont copper mine pit dewatering and post-closure is now online at the Rosemont Copper web site. The file is 43 Mb - it took my home pc quite a while to download it. CNN just posted this WDEF video online showing a spectacular rock slide in Polk County, Tennessee. I'm sure it will be picked up the excellent landslide bloggers out there but it's just too impressive to not share right now. The report concluded that "the Nevada’s gold industry ... generally supported the local economies in northern and northeast Nevada." Nevada gold production amount to just over 7% of total world production, putting the state 4th behind China, South Africa, and Australia. The report says "Total annual average direct employment in the Mining and Natural Resources sector was 14,613, up from 14,470 in 2007. Mining and metal mining in particular were still the highest paid sectors in the State economy with average pay of $69,300 and $78,600, respectively. This compares with statewide average earnings of just under $43,000." State and local taxes increased by just under 15% to $225 million. 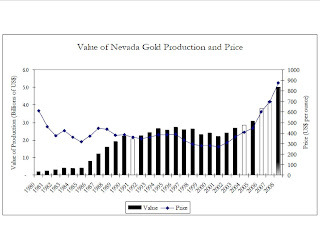 Ref: Economic Overview of the Nevada Mining Industry, 2008 – 2009, Prepared by John L. Dobra, Ph.D., Director, Natural Resource Industry Institute, and Associate Professor of Economics, University of Nevada Reno October 2009, Prepared for The Nevada Mining Association, 28p. We got confirmation that I'm scheduled to make a presentation to the Arizona Legislature's Ad Hoc Committee on Mining Regulations at their next meeting on Monday, Nov 16. The agenda should be released this coming Tuesday. 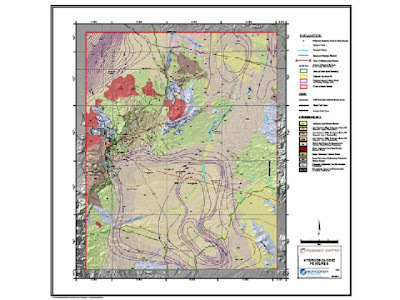 AZGS is building the Geoscience Information Network (GIN) for use by the State Geological Surveys nationwide, the USGS, and the DOE-funded National Geothermal Data System, in partnership with major technology companies including Microsoft, Schlumberger-MetaCarta, and others. Energistics, Inc. is adopting the GIN and NGDS as the prototype data integration mechanism for their consortium of 97 national, international, and multinational oil companies. 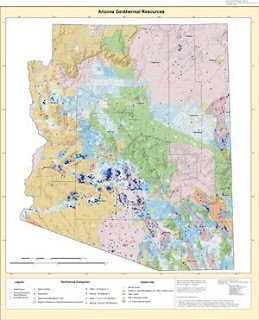 We are configuring Arizona mineral and map information for integration into the system now. There's been a little confusion over the size of the DOE award to AZGS announced last week to deploy the National Geothermal Data System among state geological surveys across the country and populate it with state-specific data. The proposal we submitted on behalf of the Association of American State Geologists was for $15.8 million to cover costs of setting up the data system among 40 states. DOE's reviewers urged them to provide up to $2 million more, for a total of $17.8 million, to cover costs of getting the remaining states integrated into the system. At this point, it looks like w e have at least 44 of the states in the coalition and more will be participating. We don't have the money in hand yet. DOE has selected our proposal for negotiation, so it will likely take 4-6 months before that is completed. President Obama named Jared Blumenfeld to be the Regional Administrator for EPA’s Region 9. This region encompasses California, Arizona, Hawaii, Nevada, the Pacific Islands, and over 140 Tribal Nations, which makes him one of the most powerful federal officials in the West. 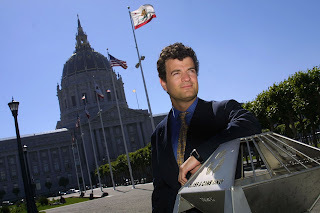 Blumenfeld is currently the Director of the San Francisco Department of Environment. The ASU team running the Lunar Reconnaissance Orbiter Camera (LROC) released a cool video last week of the Apollo 17 landing site, showing the lunar module descent stage, the Apollo 17 lunar surface experiments package, the U.S. flag, and the lunar rover. You can see the astronauts foot trails across the lunar surface. The Apollo 17 mission included the only geologist to walk on the moon, Harrison "Jack" Schmitt. The National Science Foundation (NSF)’s Advisory Committee for Geosciences (AC-GEO) released GEO Vision: Unraveling Earth’s Complexities through the Geosciences, a new long-term strategy document for the Geosciences Directorate (GEO). AC-GEO found the top challenges for the geosciences in the future to be: understanding and forecasting Earth system behavior, reducing vulnerability and sustaining life, and growing the geoscience workforce. The report shows that geoscientists are well-suited to bring the insight needed to address the pressing issues facing the Earth. AC-GEO believes the NSF is the only research agency in the U.S. with the breadth and capability to understand the broad challenges in Earth systems to protect resources, environment, energy supplies, human health and the economy. The recommendations for GEO involve maintaining fundamental and interdisciplinary geoscience research, conducting groundbreaking research, communicating the science to the public and policymakers, engaging K-12 students, and coordinating within NSF and with other agencies. The report highlights several key research areas for GEO, including natural hazards, ocean acidification, gas hydrates, EarthScope, the Ocean Observatories Initiative, atmospheric observations, and Earth science literacy. This vision document reflects four years of work by AC-GEO, and replaces the 1999 document NSF Geosciences Beyond 2000. 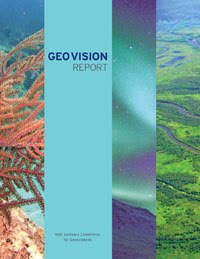 The updated GEO Vision incorporates new science, new technology, and new opportunities for GEO. An earmark to protect rare earth element mines and bills to promote access to molybdenum-99 isotopes show a growing concern in Congress over the dearth of domestic access to mineral resources. Rare earth minerals have seen their value balloon in recent years, thanks to their utilization in high technology military devices and renewable energy applications like hybrid batteries and wind turbines. 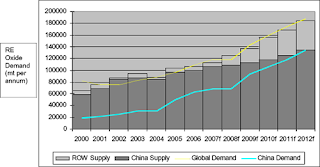 The growing interest in supply stems from progressively tighter restrictions on export from China, the world’s single dominant producer. China controls the vast majority of supply for all 17 rare earth elements, including up to 99 percent for some elements such as Terbium. After four years of decreasing permits for export, China’s Ministry of Industry and Information Technology (MIIT) has reportedly submitted a recommendation to the Chinese administration to further tighten exports. Amid global concern though, MITT responded that a ban would never be enforced. On a different, but related issue, there is growing concern in the U.S. about the supply of the isotope, molybdenum-99, which is needed for medical imaging. The U.S. stopped production of the isotope, which is a fission product of highly purified uranium-235, partly out of concerns about nuclear weapons proliferation and partly out of concerns about nuclear waste disposal. Earlier this year, a reactor in Canada used to produce the isotope broke down, nearly crippling American supplies. The American Medical Isotopes Production Act of 2009 (H.R. 3276) would promote developing U.S. production of the isotope, molybdenum-99, according to its sponsor, Congressman Ed Markey (D-MA), to ensure a stable and consistent supply of the isotope for cancer scans and brain imaging in American health care facilities. 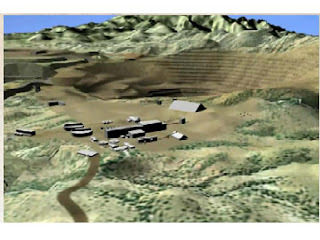 The molybdenum isotope concern has also been addressed in the National Defense Authorization Act for Fiscal Year 2010 (H.R. 2647) which became public law this month. In addition, H.R. 2647 requires the Defense Science Board to study and report on the extent to which military capabilities are impacted by supplies and the potential shortage of rare earth minerals. The Colorado Independent online newspaper says Secretary of Interior Ken Salazar received 100,000 public comments last week calling for the permanent withdrawal of a million acres public lands in northern Arizona from new mining claims. Maybe the paper is reporting on some other public comment process than the one I know about. The University of Arizona's department of geosciences is holding a dinner on Tuesday, Nov. 17, in honor of Spencer Titley, our local economic geologist internationally renowned for his work on the origin of porphyry copper deposits. Spence officially retired from the department this summer but is still actively teaching and researching. UA listed his numerous honors and awards including, the Medal of Merit from the American Mining Hall of Fame, the Penrose Gold Medal from the Society of Economic Geologists, the D.C. Jackling Award from the Society of Mining Metallurgy and Exploration, the Medal for Distinguished Achievement in Mineral Engineering from the Colorado School of Mines, the Career Distinguished Teaching Award from UA's College of Science, the Creative Teaching Award from the UA Foundation, the Burlington Northern Faculty Achievement Award for Excellence in Teaching and the Distinguished Faculty Member Award from UA's department of geosciences advisory board. The North American Imagery Program (NAIP) is going to fly Arizona in 2o10, a year ahead of schedule, because the Dept. of Agriculture got extra budget money and flew the 2010 scheduled states this year. State and local officials are looking at the possibilities of upgrading the photo acquisition to include an IR band or half meter resolution coverage. I was at the annual conference of the Arizona Geographic Information Council (AGIC) in Tucson for part of the day as a Board member, and to give a presentation on our rapidly expanding Geoscience Information Network (GIN). At the Board meeting we got the update on NAIP. Arizona has an option to contract directly with the vendor rather than going through the Dept. of Ag, and get the added or higher resolution data at a significantly lower cost. The group is going to poll the community for possible interest and financial support. The Association of American State Geologists (AASG) handed out 11,445 geologic postcards at the recent Geological Society of America annual meeting in Portland, Oregon, including a stack of our Arizona Rocks postcard. AASG puts up an exhibit booth each year at GSA and a few other meetings, to highlight the role of state geological surveys and present topics that are important to us. But for a lot of folks, the AASG booth is where you can find geologic map postcards from almost all of the state surveys. Students in particular are eager collectors, as well as teachers who use them in classroom activities. 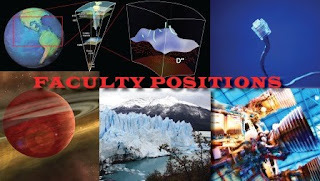 The School of Earth and Space Exploration (SESE) at ASU announced that "over the next two years, the School will be hiring a large number of faculty – at a variety of ranks – in order to build its capacity for transdisciplinary research and education in earth and space science and engineering" including Astrobiology, Astrophysics, Cosmology, Earth and Space Education, Geology, Geophysics, Engineering, and Planetary Science. This is a phenomenal investment in growing this program. The Arizona Geological Survey website (www.azgs.az.gov) cannot be accessed for a short period while the state internet service converts over to our new IP address. We have been having increasing problems with our email at AZGS with a number of service providers blacklisting us as possible spammers. So, we moved to a new IP over the weekend but the state system needs up to a day to register it. We apologize to anyone who was inconvenienced but it should be resolved pretty quickly. The Arizona Legislature's Ad Hoc Committee on Mining Regulations is holding their first meeting tomorrow (Monday), Nov 2 in Phoenix, and on the agenda is an item described as "Discussion concerning the Mining Department and Mining Museum and whether they need to be separate entities, continue under a different model or remain the same." ADMMR has been disproportionately affected by state budget cuts because more than 60% of their state appropriation goes to cover the rent and building costs of the Mining and Mineral Museum [right], according to the Director, Dr. Madan Singh. Arizona Governor Jan Brewer has called on Sec. 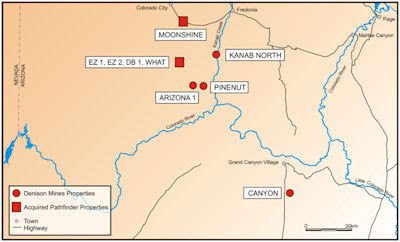 of Interior Ken Salazar to halt efforts to impose a 20 year withdrawal of nearly 1 million acres of federal lands in northern Arizona from hard rock mineral exploration and mining [right, outlined in red. Credit BLM] . In a letter sent to the Secretary on Friday, the Governor noted that federal and state laws heavily regulate mining in Arizona and the proposed restrictions are unnecessary and "will adversely impact the State of Arizona." BLM is engaged in a two-year EIS process to determine if the federal lands should be withdrawn from exploration and mining activities for up to 20 years. Gov. Brewer noted that "existing Federal law requires mining operations to comply with the National Environmental Policy Act, Clean Air Act, Clean Water Act, Federal Land Policy and Management Act, Endangered Species Act, National Historic Preservation Act, and various rules regulations and policies" established by US BLM and Forest Service. She said that the proposed uranium mining in Northern Arizona will be from breccia pipes, which are typically dry and situated hundreds of feet above any aquifers. Coupled with state requirements for Aquifer Protection Permits, this will ensure there are no adverse impacts on underlying aquifers. The Governor also argued that exploration activities do not involve extraction or transportation of uranium ore for processing and the small areas affected will be completely reclaimed. Echoing recent statements made by Democratic U.S. Senator Mark Udall of Colorado, Gov. Brewer about environmental concerns from the legacy of early uranium mining and processing in the region, she pointed out that the problems occurred with different types of activities that those being proposed now and before the wide array of protective measures and procedures were put in place. The 4-page letter described the national security concerns of the US continuing to import over 90% of this critical energy resource, while the Arizona Strip holds 42% of the nation's undiscovered uranium according to the USGS. She concluded by urging the Secretary to recognize the "overwelming evidence that responsible uranium mining can be both safe for public health and the environment and compatible with teh Grand Canyon region and its watershed." "The withdrawal proposal is overly broad and unnecessary because of the protections offered by state and federal laws that will ensure mining operations will be protective of the Grand Canyon region and the Colorado River."